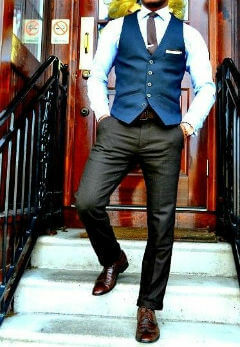 A vest or waistcoat is a garment worn on upper part of the body and typically has no sleeves. Vest is made in same fabric as suit and usually covers the bottom of the shirt and top part of the waist. Like your suit, vest can also be formal and casual depending on the style and fabrication they are made in. 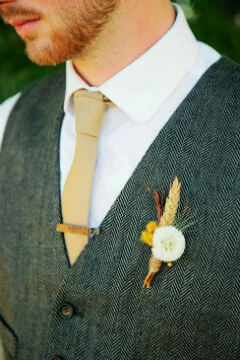 A waistcoat with your 3pc suit must always cover the vest and finish an inch above the lapel of the jacket. Same color vest on your suit adds to a level of formality to the suit which is why 3pc suits are very popular as wedding suits. A 3pc suit doesn’t necessarily have to have a matching vest, if you desire more retro look or casual look you can also wear your suit with a patterned vest for the dress down look. Tuxedos can also be worn with Vest. The formal Vest must always be worn with the jacket and are made is same fabric as the tuxedo with different color lining. Styling of the black tie vest is different, they are backless and also feature lapels covered in satin. Dress vest can also be worn just on its own without the jacket. When a patterned vest is worn with formal suit pants and business shirt it adds the touch of color and if you pair it with a bow tie, you are sure to turn some heads with your stylish dressing. Dress waistcoat can also serve the function of a casual sports jacket. Our suggestion is to keep the vest color in same family as your trousers and jacket but add a pattern to it, like a shark skin or a Prince of Whales pattern. All the vest options discussed above are the more formal once, you can also opt for a casual vest, like a sweater vest (which is a sleeve less sweater) that can be paired with your jeans, chinos or even your suit pants on a nippy autumn day. A vest is an investment as can add so much to an otherwise boring outfit. You can pair your vest with jeans, chinos for a casual appeal or wear it with your suit in winters. So if you want to add a bit of elegance to your dressing we recommend you invest in vests.